A serial shoplifter spat in the face of a shop manager who challenged him over his crimes, a court heard. James Alty committed the vile act after being caught red-handed while trying to steal from a shop last September. He had stolen a variety of items such as cheese, meats, fruit and laundry detergent from a number of shops in Astley in a four-week period. 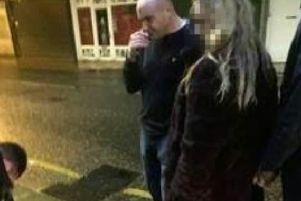 And when one of the store managers ordered him to leave when he attempted to take items without payment, she found herself victim to the disgusting spitting. After failing to turn up for his trial at Wigan Magistrates’ Court, the 26-year-old of Ludlow Drive, Leigh, was found guilty in absence of six counts of theft, as well as assaulting store manager Sherry Johnson. The court heard Alty began his crime spree on August 27, when he stole meat valued at £102 from a Co-op in Coach Road. Four days later he then stole £30 of food from Premier Convenience Store, a haul which included 50 oranges and five packs of bananas. On September 4, he stole food to the value of £62 from the Co-op in Coach Road again, before targeting a McColls store on September 9, taking washing detergent worth £55. A member of the probation service told justices Alty stole the items after falling into financial difficulty, and he denied needing the money to fund substance addiction. They also said his financial woes meant he had no cash to travel to court for his trial in December and then again in January - which meant two bail act offences were added to his rap sheet. He was given a 12-month community order plus 200 hours’ unpaid work and a 30-day Rehabilitation Activity Requirement. A restraining order was also imposed, prohibiting him from entering any McColls store in Greater Manchester for 12 months.